An aqueous solution is a solution where the solvent is water. In a chemical equation it is written by adding (aq) to the formula. 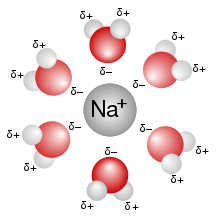 A solution of ordinary table salt in water would be written as NaCl(aq). NaCl is the part that means table salt. The word aqueous means being dissolved in water. Water is a solvent. It is found all over the place. Water is a solvent in chemistry. ↑ Zumdahl S. 1997. Chemistry. 4th ed. Boston: Houghton Mifflin Company. p 133-145. This page was last changed on 26 April 2016, at 11:00.